TThe award-winning poet and author, who has a BA in English Literature and History from the National University of Ireland, Galway (2005), and a Postgraduate Diploma in Education from University College Cork (2008), graduated from Queen’s in 2009 with an MA in Creative Writing under the mentorship of Dr Glenn Patterson and Dr Ian Sansom. Now in its 11th year, the star-studded awards ceremony took place in Dublin’s Double Tree Hilton on 16th November and was attended by Ireland’s top writers, publishers, booksellers and media personalities including writers Roddy Doyle and Cecelia Ahern, sports stars Jason McAteer and Donal Lenihan and by media favourites Gay Byrne and Ryan Tubridy. Commenting on this year’s winners, Larry MacHale, Bord Gáis Energy Irish Book Awards Chairperson, said: “I would like to extend my heartfelt congratulations to all of this year’s winning authors. The Bord Gáis Energy Irish Book Awards was founded to celebrate and promote Irish writing to the widest range of readers possible. “Each year it brings together a huge community passionate about books – readers, authors, booksellers, publishers and librarians – to recognise and celebrate the very best Irish writing talent,” he added. A past pupil of Meelickmore NS and Mount St. Michael Secondary School, Claremorris, Elizabeth was a teacher in England for a year before taking up writing professionally. Her short fiction and poetry has been published nationally and internationally and she is a Pushcart Prize nominee. Elizabeth was also chosen as Tyrone Guthrie’s Exchange Irish Writer in Varuna Writers’ House, Sydney, for 2012. A fast-paced thriller, Red Dirt (published by Head of Zeus) tells the story of three young Irish people who went to Australia, running from the post-2008 economic downturn in Ireland and their own fraught lives, desperately in search of new beginnings. Stunned by the heat and the vast arid space, they each try to escape their past in a chaotic world of backpacker hostels, huge fruit farms and squalid factories. Speaking earlier in the month to The Irish World, Elizabeth confessed that she too went to Australia looking for something different. “I was in Australia and I kept meeting all these young Irish people,” she explained. “Many of them had lost their jobs and it stuck with me hearing all of their stories. It was quite bleak for them at home but then some had also struggled to find work out there as well. Elizabeth continued: “I didn’t think I’d be able to write something so dark but that was how the situation was. There were lots of people who had travelled to Australia because it seemed exotic and there were plenty of construction and engineering opportunities. Among other winning authors on the night were Marian Keyes, Graham Norton and Paul O’Connell. Elizabeth will now compete (in a public vote) against these and the 11 other category winners for the overall ‘Bord Gáis Energy Irish Book of the Year’. The Bord Gáis Energy Irish Book Awards are a set of (15) industry-recognition awards set up by a coalition of Irish booksellers in 2007. The Newcomer of the Year category, which is unrestricted by genre, was created to reward the most promising first-time author published in Ireland in any given year. Since 2011 it has been sponsored by The Sunday Independent, whose literary editor Madeleine Keane (pictured left) has been a strong supporter of new writing in her literary pages. 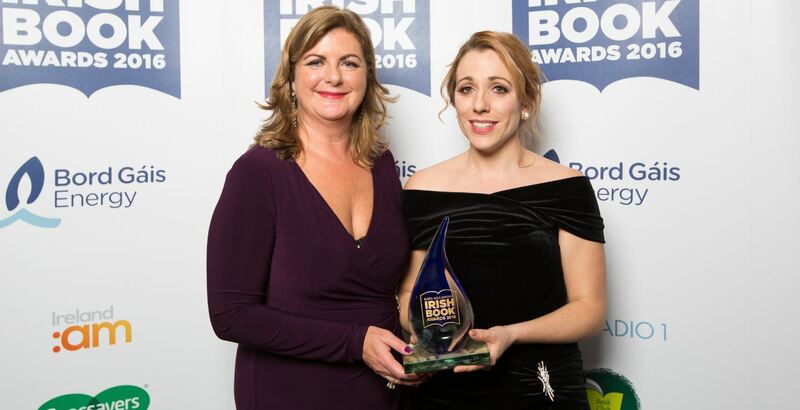 This year’s awards ceremony was presented by Keelin Shanley and each winning author was interviewed by RTÉ’s Evelyn O’Rourke in the Bord Gáis Energy Green Room. These interviews, along with highlights from the awards ceremony, will be broadcast on RTÉ One on Saturday, 19th November at 11.15pm. Voting in the ‘Bord Gáis Energy Irish Book of the Year’ is open until midnight on 9th December and anyone who votes stands a chance of winning €100 in National Book Tokens. The Irish Book of the Year 2016 will be announced on 13th December. To vote for Red Dirt, click here.